Choose from thousands of spaces in Newcastle Upon Tyne - including on-street parking, off-street car parks and 428 reservable spaces. Driving to Newcastle upon Tyne is very simple, with the London to Edinburgh A1 passing right by the city over the River Tyne, and the A69 from Carlisle following the river right across all the way. Newcastle is a particularly driver-friendly city, with over 2,000 on-street parking spaces and several off-street car parks to choose from in the city centre alone. Coupled with a fantastic internal transport system, drivers have plenty of options when it comes to parking anywhere within the city. There are 12 park and ride locations throughout the Tyneside area serving Newcastle with both bus and Metro services. 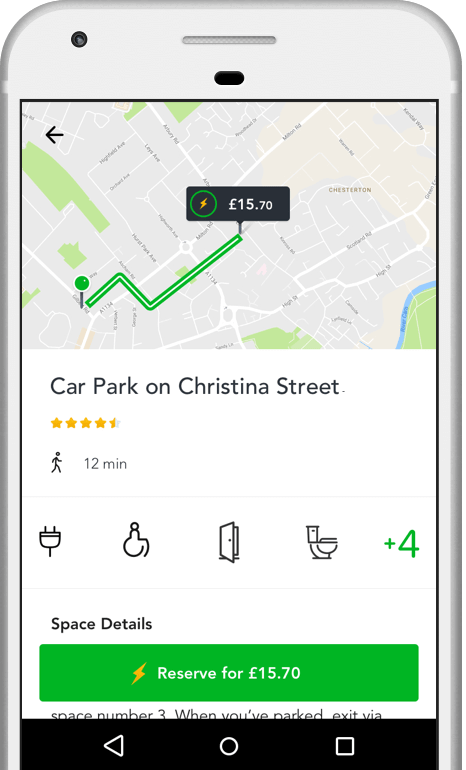 JustPark provides information on a multitude of parking options across Newcastle – including spaces on-street, off-street and those that are reservable, from driveways to car parks. Parking on-street in much of Newcastle is limited to pay-and-display spaces, but there are a good selection to choose from, and they are generally at an affordable rate. On-street parking charges in the city centre typically apply from 8am-6.30pm every day, but vary wildly depending on which street you park on – so be sure to check before you travel and pay attention to local signage. To find information about on-street parking and its availability in Newcastle upon Tyne, you can use the JustPark parking map. Newcastle City Council operate 8 multi-storey car parks in the city centre, which generally offer you a more affordable hourly and daily rate in comparison to commercially-run competitors. With around 500 spaces in the heart of the city centre, the largest and perhaps most conveniently placed of these car parks is Eldon Square car park (Newcastle upon Tyne, NE1 7RZ). Park and ride is available at a whole host of locations across the Tyneside area for cheap access to Newcastle. From bus to Metro based services, a full list of the 12 locations can be found on the Newcastle City Council website. JustPark lists a wide choice of reservable off-street parking spaces across Newcastle. You can browse these options and book a guaranteed space via our website or app. Newcastle upon Tyne is one of very few UK cities to have a rapid transit and underground transport system – The Tyne and Wear Metro, known locally as the Metro. It has two lines with 60 stations (9 of these underground) serving Newcastle, Gateshead and Sunderland, as well as North and South Shields. It proves to be the fastest and most efficient way to navigate the city throughout much of the day. Newcastle Central station, as well as being a station on the Metro system, is the principal train station connecting the city with the rest of the country as a key part of the East Coast main line. Newcastle City Council provide a number of on-street designated disabled bays for Blue Badge holders across the city, and there are disabled spaces in the majority of off-street car parks also. You can also filter when searching on JustPark to show all our parking spaces with disabled access in Newcastle (select this option by clicking on ‘Filters’ on the search results page). Much of the on-street parking in Newcastle is limited to pay-and-display or resident permit spaces, with residential areas being unusually close to the city centre. Newcastle United’s St. James’ Park is located very much in the centre of Newcastle, which does mean that on match days driving and parking in the city centre can become increasingly difficult – but little changes on these days in regard to specific parking restrictions. However, temporary signage and a heightened police presence on certain match days (such as when arch-rivals Sunderland visit) can often result in one-off specific restrictions, so it is worth being aware of the club’s match day schedule when visiting. On the JustPark map, we’ll only show you spaces which you’re allowed to park in at the times that you search for. The majority of Newcastle’s secure off-street car parks either operate 24 hours a day or offer an affordable rate for overnight parking. Enter the dates and times you need parking and search via JustPark to see what’s available overnight. Parking charges for all on-street and the majority of off-street parking spaces remain in force on all weekends and Bank Holidays. Newcastle is a beautiful city, especially when driving in at night across the River Tyne, illuminated by the elegant Millennium Bridge. The Quayside is undoubtedly a highlight of this city with a vibrant scene of bars, clubs and restaurants dotted all along the riverside. As you delve into the city centre, a key feature of the Newcastle skyline is the impressive St. James’ Park – bringing the city to life on match days, with its central location providing those shopping on nearby Northumberland Street with an atmospheric backdrop. All this urban wonder can soon be traded in, though, with a short walk north – where you’ll soon go from dodging cars on busy city roads, to dodging cows roaming freely on the city’s Town Moor, close to the city centre. Park up, explore and enjoy! Rated 5 stars with an average satisfaction rating of 96%, JustPark is the UK’s favourite parking service. But don’t just take our word for it – check out some of the latest customer reviews for our Newcastle Upon Tyne parking spaces at the bottom of this page.